The only thing better than a burger is one you get to dip. 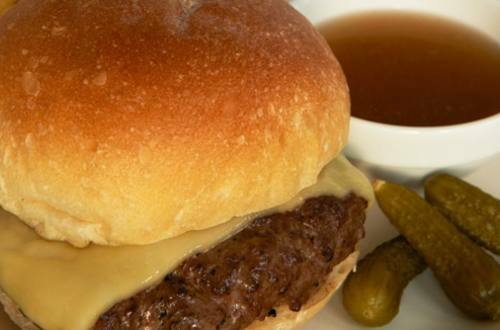 Our French Dip Burgers recipe pairs juicy burgers with a mouthwatering dipping sauce to help you soak up every meaty bite. 1 Combine 1/2 of the Knorr® Homestyle Stock - Beef with ground beef; shape into 4 patties. 2 Grill or broil burgers, turning once, until burgers are done, about 12 minutes. 3 Meanwhile, bring water and remaining Stock to a boil over high heat in 1-quart saucepan. Reduce heat to low and simmer 2 minutes, stirring until Stock is melted. Evenly pour into 4 small bowls. Arrange burgers on buns. Top with cheese and serve with dipping sauce.